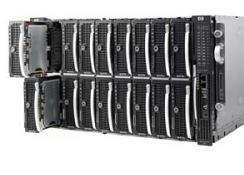 The first Itanium 2 server blade for the HP BladeSystem p-Class family, the HP Integrity BL60p can help you significantly enhance application deployment, resource utilization, capacity management, and reliability and security, when it is combined with the HP-UX 11iv2 operating environment. Vibrant offers complete configurations as well as individual parts and upgrades for this model. For pricing on new or used HP BL60p servers, upgrades or parts, please contact Vibrant sales at sales@vibrant.com or call 888-443-8606 or 952-653-1700.